Clean it Quick. Always clean spills as soon as they happen. Remember – time is of the essence. Floor & Door Mats Matter. 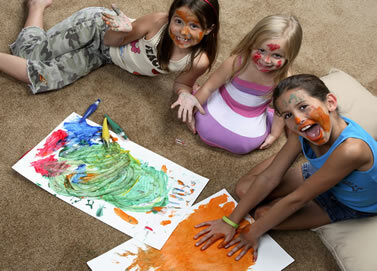 Reduce carpet traffic patterns and teach the family to wipe their feet. Light Up Your Life. Use Ultra-Violet UV lighting to locate hidden urine stains from pets, then promptly clean. Don’t Rub or Scrub when Cleaning. Carpet should be dabbed in a gentle manner to pick up spills or clean spots. Vacuum often, at least Twice a Week. Not only does it eliminate dirt and debris, but it also helps keep carpet fibers well groomed. HEPA Helps. Use a HEPA air filter in the vacuum cleaner or as a stand-alone system to reduce dust and pollen, which pollutes the carpet fibers. Eliminate Harsh Chemicals. Think twice before using harsh chemical cleaners, detergents, and other popular household cleaners on your carpet. Most leave a nasty residue behind that eventually leads to more build-up, and even potential health problems. Forget the Fragrance. Deodorizers simply mask the underlying cause of carpet odors and actually create a larger problem later through the accumulation of toxins, powders, and debris left in your carpet long after the fragrance has faded. Ice is Nice. Sticky spills or stains, such as candle wax or chewing gum, can often be removed more easily with the use of ice. Simply apply, let it solidify and then gently remove. Degrease. Oil based stains often respond to the use of a gentle degreaser like dishwashing liquid. Use a few drops combined with water when a spill or stain first appear. Is it Colorfast? Before attempting carpet cleaning or stain removal on your own, you should test the spot remover to make certain it does not discolor your carpet or rug. Testing in an inconspicuous area can can give you an indication whether or not your carpet or rugs are colorfast. Keep Yourself and Furniture off of Wet Carpet. After carpet has been cleaned, do not walk on it until it’s dry to avoid resoiling. Also, keep furniture off the carpets completely, or place protective pieces underneath. Wet carpets can cause varnish, paint, or lacquer transfer from wooden furniture. Metal legs or foot pieces can rust from moisture, which can discolor the carpet. Remember to ask our technicians to provide great carpet cleaning tips at your next appointment, too!